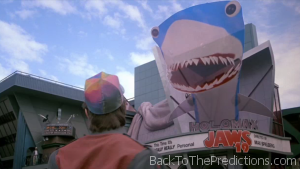 Left Shark may be all the rage ever since the Super Bowl, but back in 1989 the writers of Back to the Future Part II couldn’t resist including this reference to one of Steven Spielberg’s other big films, Jaws. The original Jaws film was released in 1975. Sequels were released in 1978, 1983, and 1987. With four films over 12 years, predicting that another 15 would be made in the next 30 years seems rather optimistic. In those three decades, there have been some Jaws video games and theme park attractions have come and gone, but there’s still just four films. Maybe the writers thought there would be more sequels as 2015 approached, but with the fourth and final film in the Jaws franchise being released two years before Back to the Future Part II, this clearly missed the mark.